Getting to the island... at last ... at home on North Captiva! 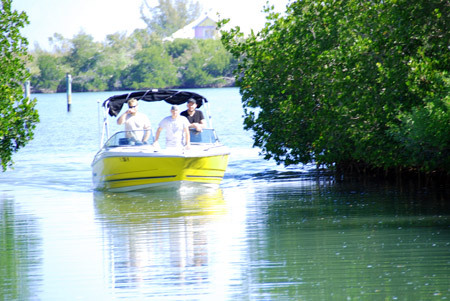 The port of entry for all of our guests are North Captiva Island Club Ferry Stop (Just for Fun Ferry). An outdoor lobby with waiting area and covered porch is the ferry landing at North Captiva Club. Our Guest Services Representatives will meet you at the dock with your beach buggy and help you with beach gear, luggage, and groceries... to get you to Windswept right away. Gratuities for Guest Services Reps are greatly appreciated. On the ride back to the house they will give you a brief island tour and point out various things you will want to return to later. An island map is also included at the house inside our guest information book. If on-island, your hosts, Mark & Wendy, will greet you too! We can help you with check-in and familiarize you with Windswept's amenities. If arriving by your own boat, arrangements can be made to greet you at the slip for check-in. Upon arrival, please start unloading the vessel and call us for assistance. Your carts will be waiting at the slip for your arrival. If you require a guest services agent for assistance when arriving with your own boat or rental boat, we request that you rent a slip that is located at the North Captiva Island Club Marina or offered by Boats and Fun Boat Rentals. If your slip rental/boat rental dock assignment is at any other island location, an additional guests service check-in fee will apply. Did we meet your arival expectations? "- Above and Beyond! The cookies hit the spot! -Every need was met before we arrived and while we were here. We enjoyed our stay - Thank You,"
Along the way to North Captiva... before you get here. Travel to North Captiva should begin with checking on great flights to one of the major international airports nearby. SW Florida International (RSW) is a quiet and convenient airport to traverse. Mostly on One Level and very easy to access the parking areas, navagating it is truly a pleasure. Please plan you flights so that your arrival, on check-in day, will be before 2PM if you would like to take the last ferry to the island at 5PM. This saves time for some stops and plenty of time to pick up grocery before the boats leave. Don't forget, a private water taxi ride is always an option. The cost is a little highter than the scheduled ferry, but we always suggest guests find the best way to get to Windswept on that first night and start enjoying vacation as soon as possible. Tampa (TPA), Sarasota (SRQ ), and Fort Lauderdale (FLL) are a good distance away to the North or East, but Airfare Deals often make it rewarding to travel up to 2 hours by car down to Pine Island. 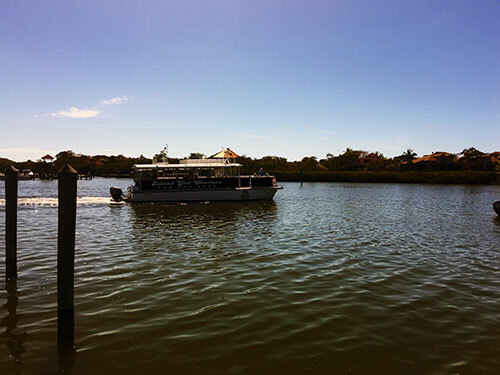 Begin your discovery of Windswept, and North Captiva Island, aboard North Captiva Club's own Ferry System. Your first stop is the Arrival Center and Parking Lot. The taxis, airport shuttles, and private cars all stop here to park and unload. Luggage is labeled for your destination and the guest service agent will help you to check in for club use (for pool keys, kayak useage, tennis access) and set up a house account (for pool bar & dining charges). Then board the bus for a 1 minute ride to the marina. (Please bring small items, laptops, or valuables with you). Your second stop is the beautiful scenic boat ride to the island. 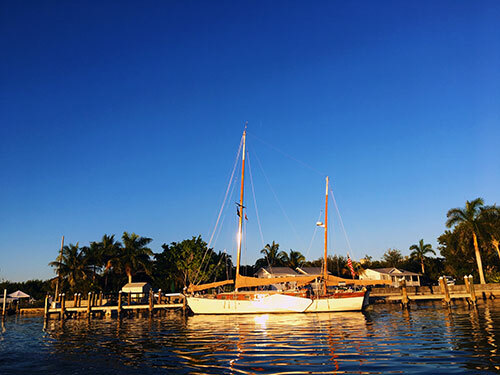 This relaxing journey leaves from southern Pine Island and travels the waters of the Intracoastal Waterway and Pine Island Sound. 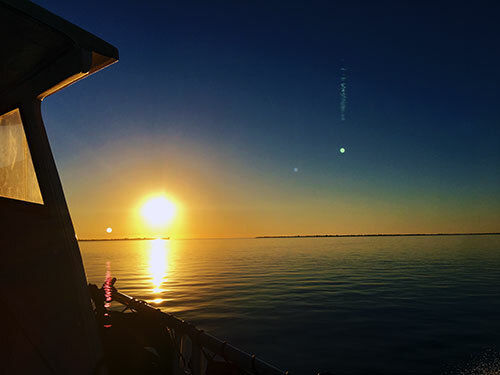 While aboard, watch for dolphins and enjoy the stunning natural scenery, glimpse historic fish/ice houses from the 1800s, and feel the cares of the mainland life just melt away. You can even see the little tippy top peek of the Windswept turquoise roof from the boat ride too! Your destination is Windswept... Welcome Home! 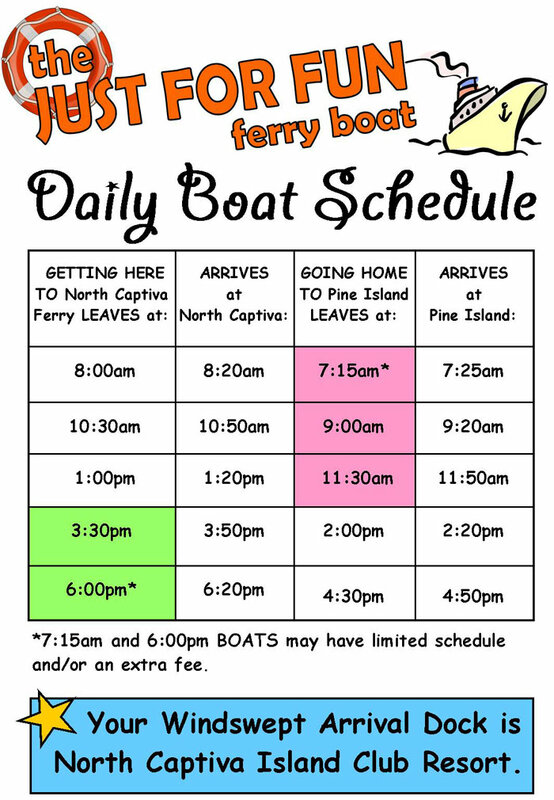 In the case Just For Fun Ferry Boats are filled, they also offer private boats and add more scheduled ferry times during peak rental arrival/departure days for your convenience. Later evening arrivals are no problem, just reserve a private boat. Private arrival ferries can be scheduled for as late as 11:00PM (additional ferry ticket cost applies). Please Reserve your Just For Fun Ferry tickes well in advance of your arrival dates, boats book up for peak weeks and then alternates may be used in that circumstance. Contact us with your arrival plans, and we can offer you all the best options. 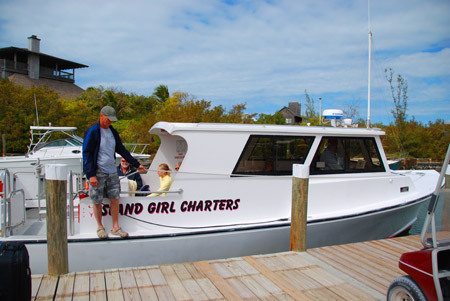 *If your ferry boat reservation is for Island Girl Charters, you must make special arrangements with us for a guest services' assisted check in at the Barnacle Phil's Ferry Landing . *For any Barnacle Phil's/Island Girl Arrival, please NOTE that an Additional Guest Services' Check-in Fee ($75) will apply and an additional per person/per arrival/departure landing fee may apply for the Barnacle Phil's Location. 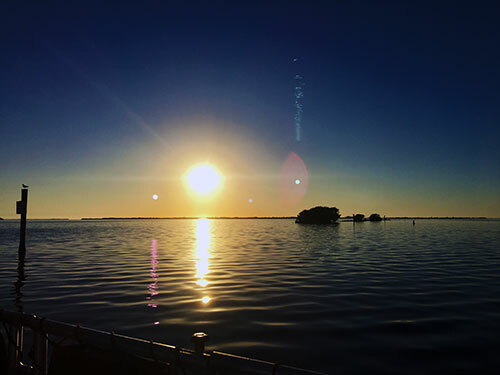 This is the content for Layout Div Tag "photos"
Personal water taxi to and from southern Pine Island, excursions from North Captiva to other surrounding islands... scheduled to your exact arrival/departure needs. Call to Reserve. Owner of Boats and Fun - North Captiva Island Boat Rentals, offering jet ski tours, boat rentals, scuba diving, transportation to Captiva for Parasailing Excursions, fishing gear, bait, and fresh local seafood delivery. Jensen’s Twin Palm Marina, Captiva Island (239) 472-5800 Personal water taxi to and from Captiva Island, scheduled to your exact arrival/departure needs. Call to Reserve. *Important Note: Please allow time for Grocery Stops well in advance of your scheduled water taxi ride. 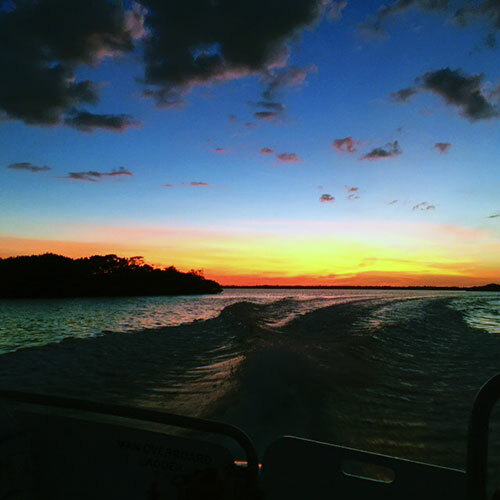 All of the Captains serving North Captiva Island provide us a truly wonderful gateway to the island. And, please make sure you make reservations with the Captain of your choice in advance of your arrival day. Tips for their superb service are a customary part of arrival and departures, please tip your captain's and mates, they very much so appreciate this. 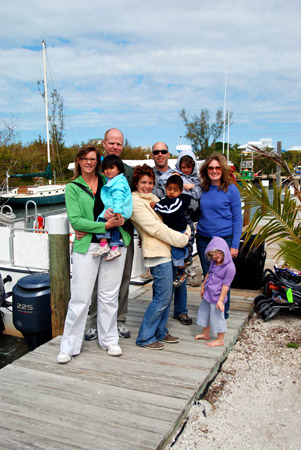 - We all thought North Captiva would be a repeat Vacation! Yeah! From I-75 (exit 143) or US 41, head west on Pine Island Rd. (State Road 78), then take a right on Stringfellow Rd. (State Road 767) in Pine Island Center. Three miles down, take a left on Pineland Road. This will turn into Waterfront Drive and you'll see the Marina on the left, nestled on the shores of Pine Island Sound. *Important Information: When driving from airport (RSW), allow 1 hour time to get to Pineland Marina or Four Winds Marina. If you are Grocery Shopping account for an additional 45 minutes and make sure you arrive at the Marina 15 minutes before your scheduled water taxi departure. *Most taxis require an additional fee for making a grocery pick-up stop, stopping at the fresh fish market, and or a Target or Walmart. Please call each independent taxi operator for pricing and details. Safety Harbor lies South of Boca Grande and Useppa Island off of the Intra-coastal Waterway starting at Marker # 52. Set your compass bearings to 195 degrees from the Marker and it will take you right to "The Fish House." Enter Safety Harbor around the Peninsula and follow the Markers to Hidden Cove. Meet us at the Docks and you'll be "on island time." Slip rentals are available at rates ranging from $35 per day to $2per foot/per day. Slips at the NCIC marina are located approximately 1000 feet from Windswept. We ask that all guests bringing their own boats or renting boats for arrivals rent slips via NCIC. Their check-in staff will be there to assist you. They will need to know the size of your vessel and your planned arrival time. Late evening arrivals are not reccommended for those just coming to the island for the first time ever - by boat. The local waters are amazing, scenic, dynamic, and can be shallow - so running aground with a boat full of family, friends, luggage is not the way to start a vaca... Let us know your plans and we can help! We have boated to the island here for more than a decade, also on our own little 20 foot boat, and we are ready to help you with arrival and boat trip advice. For all private boat arrivals, cart(s) will be located at the club for you and the Guest Services Staff will be available to help you to the house. Just call us once you have arrived at the house and we will give you a full tour. (239) 283-3593 for Parking fees, Launch fees, and temorary docakge fees information. The channel through North Captiva's Safety Harbor can be tricky for first time boating arrivals here is a good map to see the channel into the NCIC marina.